Archery is a fascinating sport that places accuracy as the primary skill the practitioner of the sport must have with their bow. To make archers sight their targets accurately and easily, there is a tool called bow sight. 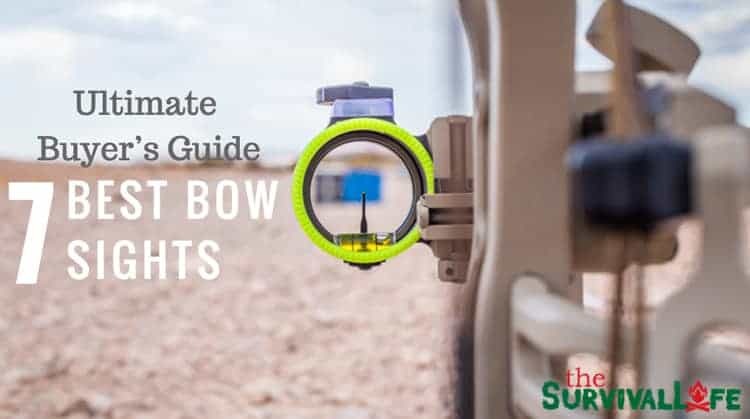 In this article, we offer options and knowledge in choosing the best bow sight 2019 available in the market. 1. Start by Preparing The Necessary Equipment and Materials. 2. Next Step is to Set Targets at Preferred Ranges. 4. The Second Pin will be Focused on Up and Down Shots. It’s more reliable than a peep sight in accuracy. You can effectively use a bow sight in low light conditions. It saves you more money in the long run. Each bow sight has its own advantages and disadvantages from the simple sights to the most complex sights. For beginners, there are good quality bow sights at a price range of less than $100 with premium features. For experts and in archery competitions, a superior quality might be possible. It depends on what you want and how you want to use it. This type of sight is the most common for archers. It usually has 3 to 5 individual pins that can be adjusted to set a particular distance. The top pin, for example, is for close range aiming, while the bottom pin is for longer distances. What makes them popular to archers is that when the pins are set, they stay that way as “fixed” throughout (the hunting or targeting session) until you feel that you may readjust them again. Setting the pins require trial and error, and you must come up with three to five distances. The best recommended increments from the first pin to the next are by 5 to 10 yards. Shooting with fixed pin is relatively easier because when you want to shoot at 30 yards, just target it with the preset 30-yard pin. The pin would compensate for the change in arrow’s trajectory. Its accuracy is superb at known distances. For unknown distances, the archer needs to have good estimation skills and do the readjusting simply. The main advantage of a fixed pin sight is that you can add or remove pin sights at will. Its versatility and accuracy is an excellent choice to most archers who do hunting and target shooting. This is different from the fixed pin because it is simpler with only one adjustable pin. Its movements are up and down and done in a matter of seconds with its housing system doing the sliding movements. The sight is composed of brackets, levers, and worm gears. To use this sight, the archer must utilize the white tape with marks or a graduated scale found on the rear of sight bracket. Each mark would represent a specific distance and sight your target manually by moving the pointer to that particular mark. Like fixed pin sights, the best recommended increments for every mark is about 5 to 10 yards. If your target falls to a distance between the two marks, adjust your pointer between them and shoot. The scaling in this bow sight is pretty accurate. The disadvantage of moveable sight is with unknown distances, and you need good distance estimation. The shooting is not continuous because you have to adjust for every distance unlike having multiple pins despite the accuracy being top notch. That’s why, this is recommended for target and competition shooting, but not hunting. 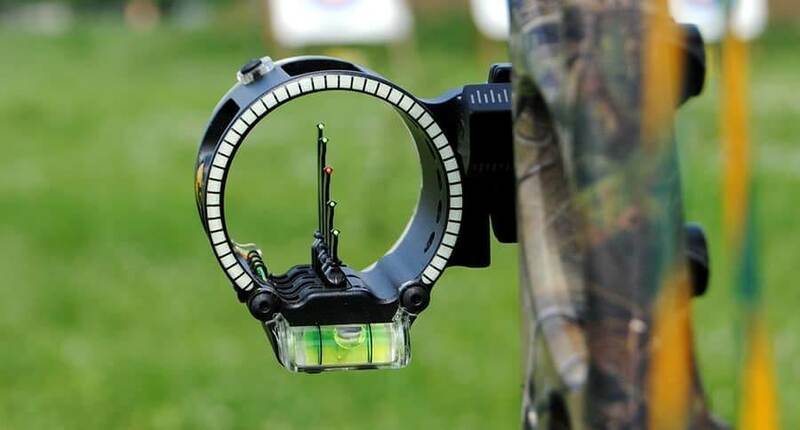 Pendulum sights are also called treestand sights. This is because you do the aiming and shooting from higher ground, like a tree, to the downward direction. Pendulum sight was developed for hunters and archers that struggled for a perfect shot. Shooting at a level ground versus from an elevated position is entirely different. You will have to calculate the angle you will be aiming and sometimes the arrow won’t land the hit because of gravity and the height. But since the invention of pendulum sight, these struggles are lifted. This pendulum sight has a single pin that is mounted on a hinged pendulum swing. When you aim downwards, the pendulum swings out and up, realistically pointing the angle where you need to let go of the arrow. The aim with a pendulum sight is best up to 30 yards. 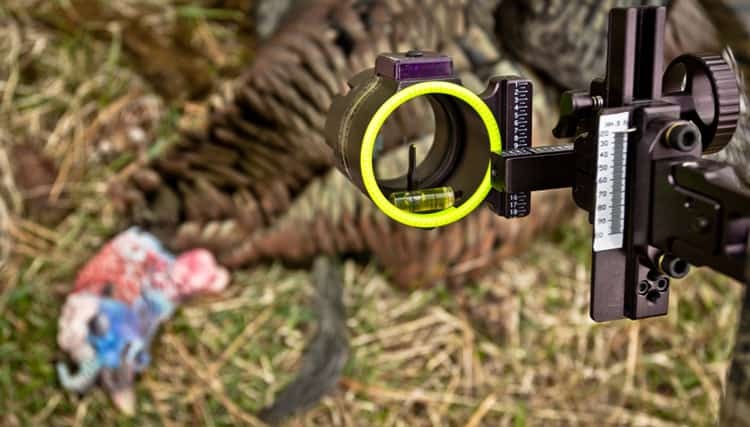 Level ground and uneven terrain don’t work for a pendulum sight. It’s only good for downhill angles and short distances from an elevated height. And to master the use of this sight may need several shots. Competition sights are the most accurate type but also the most expensive. However, they are the most advanced sight that can help you win your competitions easily and on the spot. A competition sight has features that are enviable to most archers. These are intricate system for elevation, disconnect systems for mounting and dismounting, large target sights, threaded receivers for aiming points, to name a few. A competition sight is like a moveable sight, but fancier. When properly set up, the target sights can include pins, laser lights, crosshairs, and scope style. However, due to its cost, size and the difficulty, this is unfit for hunting. Bow sights or bow scopes are devices mounted on a modern bow’s riser. A bow sight is typically like the sight seen in rifles and shotguns because it can make you aim better. It helps by showing you the pinpointed projectile position where the arrow should hit. The instinctive shooting is tough and could take many years to master. But with a bow sight, even a newbie in archery has the chances of hitting their target bull’s eye. 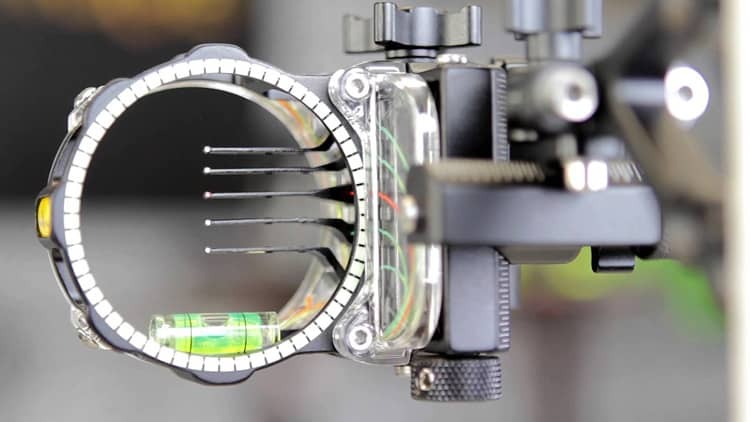 In buying bow sights, several factors are considered e.g. on your surroundings and current skillset. If you are looking bow sight for your compound bow, Field Logic IQ 5 Pin is the best. 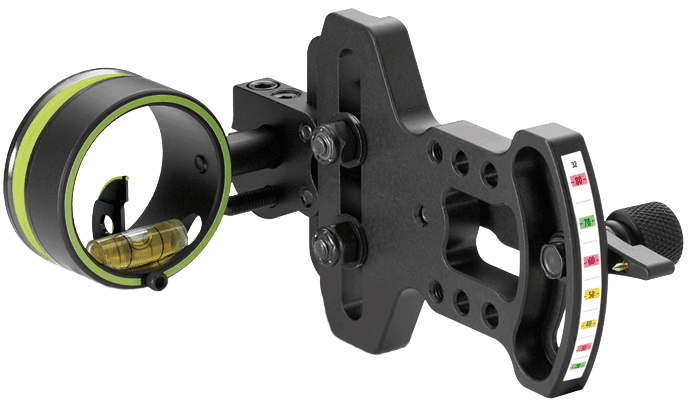 This bow sight made by renowned Field Logic makes it to our list of best bow sights. Many gave their commendations to this bow sight because of its consistency and accuracy. 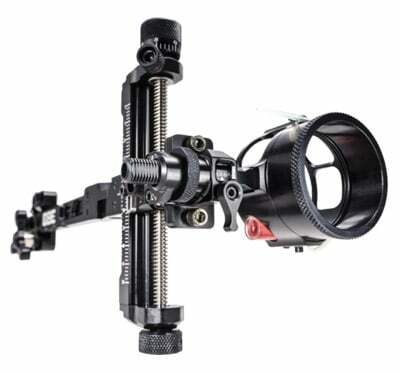 You will appreciate this bow sight because it is very easy to mount on your bow and how simple it is to adjust the sight, along with the 2nd axis. Aside from that, it has its Retina Lock Alignment Technology that is designed to improve your shooting. This technology is about form and consistency, helps you control the movements of your muscles and increase your effective range. And eventually, eliminate shaky motions that will make you miss. A type of fixed pin sight because of 5 pins, IQ 5 allows you to set from close 10 yards to distances with increments at 5-10 yards up to a maximum 40 yards. If you are one of those shooters who don’t like a full sight due to numerous pins, this bow sight can be a little difficult for you. Moreover, there’s no option to remove the number of pins if the archer wants to downscale to 1 pin or 3 pins. There are also issues about using the sight in extremely low light conditions; it is said that the fiber optics for lighting the pins aren’t enough. The five pins are adjustable and individually colored as for you to easily memorize the distances you associated with them. The IQ dot is positioned at the center of your shot as you release the string and assures a hit on the spot. 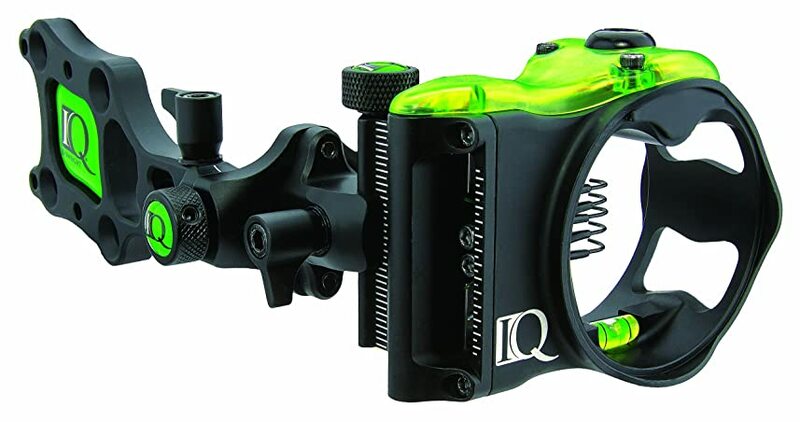 IQ 5 is specially designed to be comfortable and thus improving your aim at low light with fiber optic technology. This sight can use for both left-handed and right-handed shooters. Adjustable 2nd axis, easy to mount. This 5-pin bow sight from Trophy Ridge is perfect for bow archers who want their sight to be as accurate and as versatile as possible. What sets it differently from other bow sights is that it is 25 percent lighter than most sights that are made of aluminum. Adding to that, because it is made of copolymer material, its aluminum can withstand rust and corrosion and its synthetic part is lightweight that doesn’t tip off the balance of the bow and reduces the vibration. Its versatility is excellent and can be used in different situations. You can shoot on a level ground or from the top of the tree. The mechanism behind is it has several holes for mounting that you can manipulate depending on your preferences. Its mounting bracket is reversible that can be used by left-handed and right-handed people alike. Aside from the bubble levels, it also has a 2nd axis that you can adjust for wind and elevation. To see in different conditions, aside from the ultra-bright fiber optic pins, it is also equipped with rheostat sight light that can let you see in the dark. There are some concerns among consumers regarding the bracket being not as durable as others, leading to being vulnerable to cracking or breaking. If your bow sight is covered with a lifetime warranty, this wouldn’t be a big problem. Though this product is great overall, most shooters are disappointed with the plastic construction as it’s not as durable as aluminum especially in the long run. One more concern for this bow sight is it’s rather on the heavier side at 11 oz. This bow sight is definitely for people who want to focus more on shooting and saves you time from adjusting the sights frequently. Good for left-handed and right-handed shooters. If you want a more outdoor type for a bow sight, you will want to consider this one. This bow sight is perfect for hunting because it can withstand weather conditionsand how easy it is to mount onto your bow. Its accuracy can reach up to 80 yards, and even newer archers can shoot their target up to that distance with renowned confidence. This one is a moveable pin type, and yet it is very easy to line up your target with this bow sight. It is very adjustable to the appropriate yardage that you don’t need many pins. If you sight in at 20 and 60 yards, the directions will show you the calculation from its sticker with yardage increments. You can unleash your abilities at dark places because of the fiber optic technology that gives you visibility and is about 5 feet in length. The bow sight is good overall in performance but there are some key points raised by some shooters. For instance, since it’s a one-pin sight, it would be difficult to adjust the yardage if you only have a few seconds to make accurate shots. Adding more to the advantages of this bow sight, it also has rheostat light that you can adjust depending on how bright the pin you want. No need for batteries dying on you anymore! The difficulty in seeing your targets clearly are now a thing of the past. With bow sights, you can fire arrows with ease and also in low light conditions. 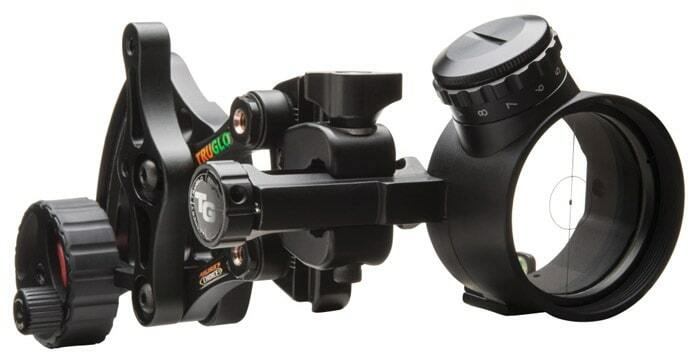 This bow sight by TRUGLO is no different because their brand is one of the leader manufacturers of the most advanced sights and accessories. TRUGLO boasts their Zero-In Adjustment Dial technology that can give your pinpoint accuracy and ultra-smooth dial for elevation and windage turning with their Micro Adjust feature. Instead of pins, this bow sight has green LED dot for aiming. And even though it has no fiber optic cable installed, the 700-hour battery compensates for it so you can do shooting arrows in a low visibility setting, even in long distances. You will probably be one of those customers who will later find out there’s a little concern with the center dot of the bow sight. Since the aiming point of the LED is made of glass, direct glare from the sun could make the sight useless for a moment because you will see nothing but a bright light before you can clearly see the surroundings. This doesn’t happen often but only if the bow sight is at a particular angle. Another issue was with the LED and batteries. The LED could burn up unknowingly, and though the batteries last for a long time, you won’t know when it will dry up too. The problem can easily be addressed with the lifetime warranty of the bow sight. So this con shouldn’t worry you too much. The scope has a ½” diameter circle and the green dot is housed in the center. The sight housing also accept 1.87″ though you have to purchase it. But what’s more, in this product, you have a simplified setup of up to 40 yards of pre-marked yardage. It’s definitely good for either left-handed or right-handed. 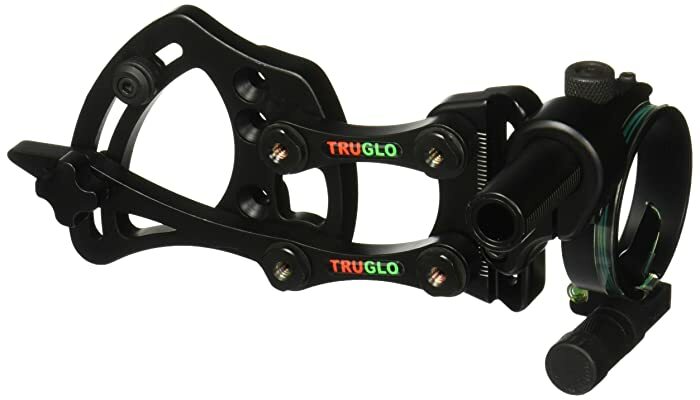 This bow sight by TRUGLO is exceptionally popular with treestand shooters because of its pendulum technology. It’s very adjustable and can make you shoot up to 35 yards. Besides, it’s also extremely quiet. If you want to take the bow sight in a level ground, it’s possible. You can lock the pendulum in place because of the adjustable bracket and focus more on aiming with one adjustable pin (0.019″) sight. It’s like purchasing a 2-in-1 bow sight. Despite being made out of aluminum, it is lightweight. And because it’s aluminum, you can expect this to be very sturdy and rust-resistant. Everyone can certainly use this because you can adjust it depending on what’s your dominant hand: left or right. It’s really an advantage because of how easy the installment process is. 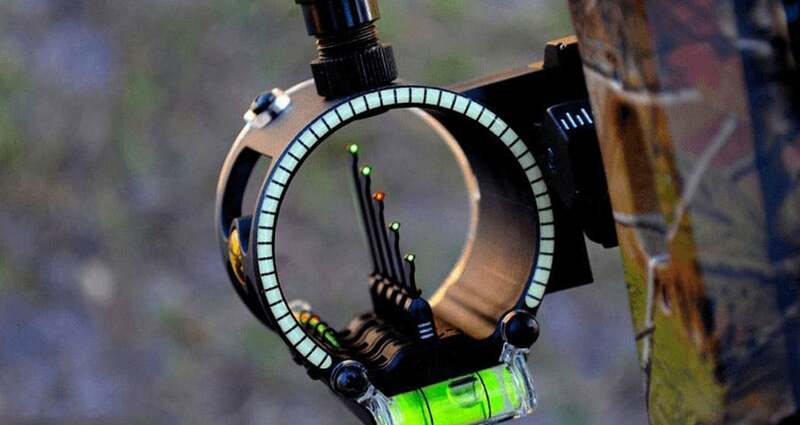 You might be glad this pendulum sight is ideal for tree stand shooting; however, there are some downsides that come with it. Most shooters are not comfortable with the bow sight as something that can be interchangeably used by both left-hand and right-handed user. If you are a left-handed person, you may need to remove a screw first before you can finally use it. But, if removing a screw is not much of a problem to you then you’ll do good with this sight. The fiber optic cable installed can make you see in low light settings, and comes with a removable rheostat light. No more need for batteries if you have rheostat light. This premium sight by Trophy Ridge won’t disappoint you. Though at one pin, this bow sight is capable of shooting at any range by just setting up two yardage points. Sighting in is made easier because of the Smart Pin Technology wherein your bow sight can calculate the pin gap of up to 100 yards. Utilizing the Smart Pin Technology on a sight is considered by Trophy Ridge to be the most accurate sight to date. Setting up is easy. Just sight in approximately 20 yards in your pin with the help of the toolless micro adjustment knobs for windage and elevation. Set up your next yardage point to any numeric value up to 100 yards. Things are getting better because this bow sight has second and third axis adjustments. You can use this one even on a treestand without missing a shot. Made of 100 percent aluminum, you will never question its durability as this one will last for a very long time. Though this sight is one of the bests out there, certain concerns were raised by users. The sight housing was prone to cracking at extreme cold weather even though the material used is a reinforced copolymer that makes the bow sight lightweight and durable. 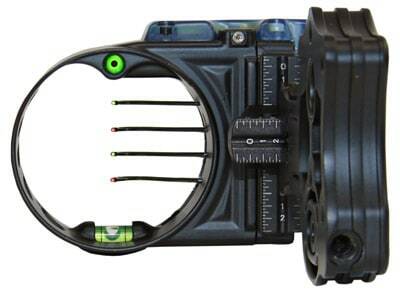 This bow sight by Apex Gear is a great piece and is acclaimed by lots of hunters and shooters. 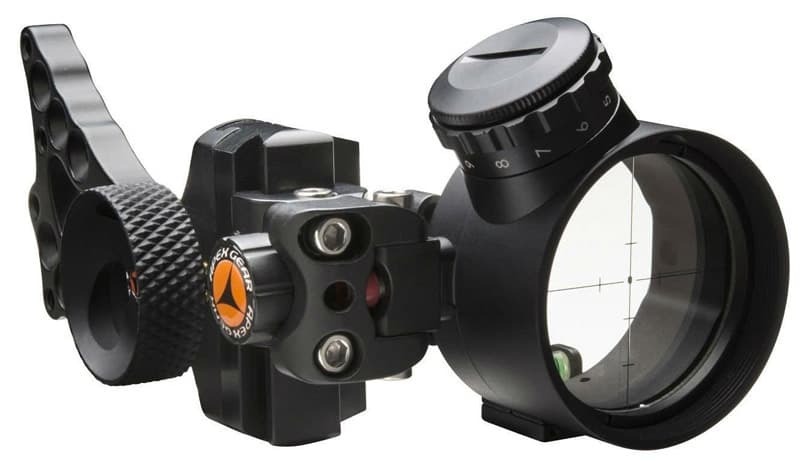 Apex Gear claims that Covert Pro is their most advanced dot sight to date. Being a center dot sight, it saves you time from multiple inputting of yardage points with pins. The dot color is green which makes things easy if you’re color blind. Covert Pro utilizes Pwr-Dot Illuminated Center Point Technology that makes it possible for you to set the brightness through eleven different options. One main feature of Covert Pro that you’ll surely like is the Gravity-Line technology that allows the pin movement to align with gravity. Yardage is easy to adjust with one hand smooth adjustments. Accuracy is guaranteed through the vertical and horizontal tilt adjustments that make the sight more compelling at 60 yards. Though the pre-marked yardage tapes are over 60, setting up two yardage points is made easier because of the rear-facing, easy to see yardage tape location. A common concern among all dot sights is their batteries. Though this bow sight uses CR2032 battery that lasts for a long time, unexpected circumstances like battery dying up and failing could render the sight useless. Set up for Covert Pro is easy. Minimum yardage is at 20 yards based on the tape, and before sighting it in, you need to rotate a yardage adjustment knob to align the yardage pointer to the 20-yard mark. Loosening the elevation lock screws and adjusting the aperture to 20 yards follow next. Retighten the elevation lock screw back. For the second yardage point, minimum is at 40 yards. Next step is to move the yardage adjustment knob and yardage pointer. Retightening the yardage lock completes the process. 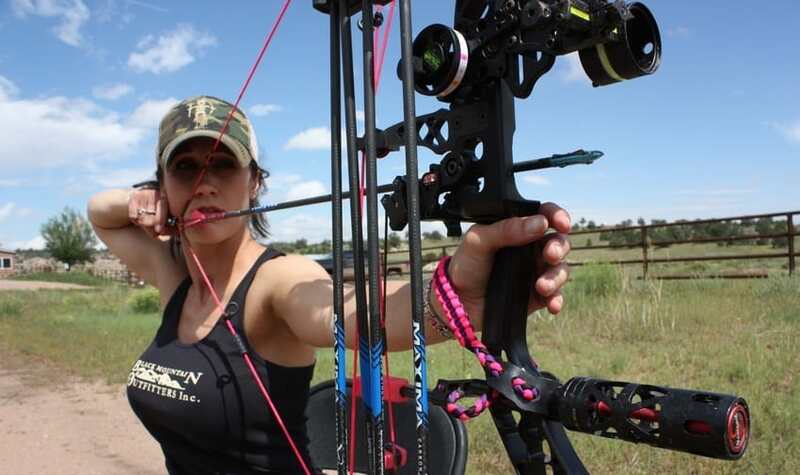 Bow hunting with a compound bow or a crossbow is not as easy as you might think. There are many variables which make the arrow hit its target like the air direction, arrow drop, equipment, human factor, etc. And so, learning how to sight in a bow is a crucial process to increase your probability of a successful hit. Getting a bow perfectly sighted is simple but can be frustrating if you’re trying to shoot at longer ranges. 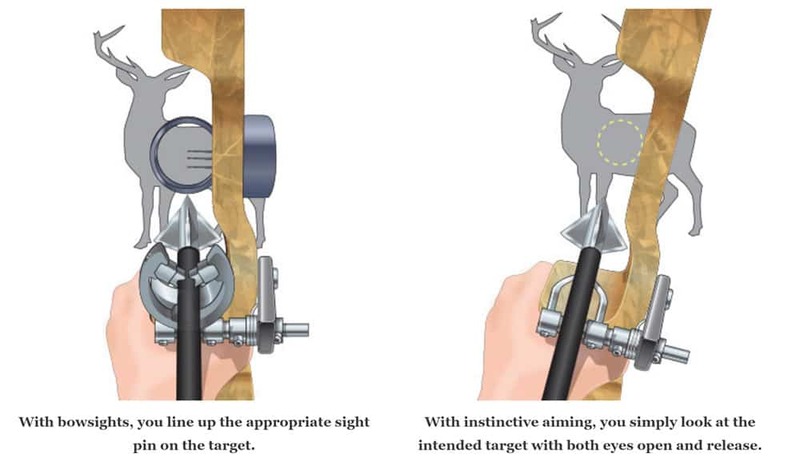 The bow sight you intend to use throughout your hunting sessions must be well-chosen and has the necessary qualities you seek whether you prefer hunting at shorter or longer ranges. 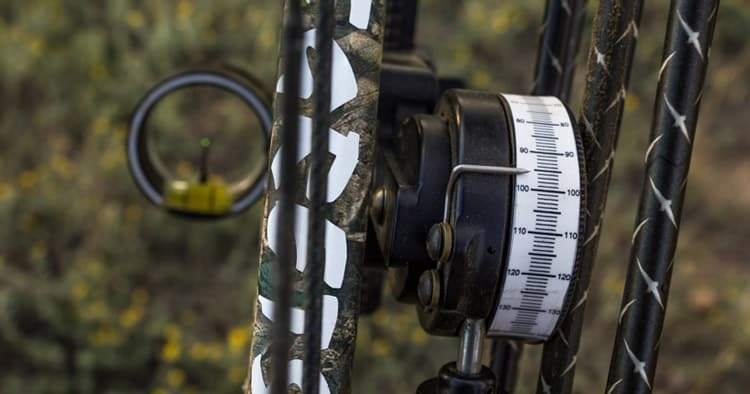 Mount the sight to your bow and ensure that you line it up until it’s at a perfect right angle with the bow. Also, ensure that the sight line’s with your vision naturally. Start marking off distances at 10 yards to 50 or 60 yards in 10-yard increments. Depending on your preference, every 10 yards will be represented by a pin in your bow sight. You’ll encounter lots of trial and errors to secure the perfect shot. Before shooting, ensure that the pins are at the center. In this way, you have more room for adjustments without being confused later on.In adjusting the pins in your sight, you will need to use Allen wrenches. Set your first pin at 20 yards. Position yourself at the 10-yard marker and be at the right angle to the target while aiming. Release an arrow to the target as you look down the sight at the top pin. Repeat this a few more times. Go near the target and observe where the arrows landed in comparison with where you were aiming. If the arrows were off from your aimed spot, then, move the sight a little into the direction where the arrow landed. Note that the first pin is only concentrated to left and right shots. Repeat the adjustments of the sight until the arrows hit where they are supposed to. Set it at 30 yards. Make sure that the adjustments of this pin are deadly accurate because this will be your anchor point. You will not be changing this pin permanently. Repeat the process as with the first pin such as firing the arrows repeatedly as well as moving the sight in the direction where the arrow landed. In sighting in the next pins, you will no longer move the sight box. This time, what you should move are the pins themselves. For instance, if you set the pin to be at 40 yards, simply adjust the pins accordingly. Note that the distance between the 30-yard and 40-yard pins are greater than the 20-yard and 30-yard pins. After learning how to sight in a bow, you must double check the accuracy of the pins especially the pin for shooting at 30 yards. The 30-yard pin acts as a reference point when you desire to change the ranges of the first and last pins later on. So currently, there are two main techniques on how to properly aim your bows. Now, when do bowsights work best? This method, on the other hand, is more flexible than the previous approach. However, this technique greatly relies on the user himself as oppose to using bow sight where you only need to judge your distance; then the bow will do the rest. Instinctive aiming, from the name itself, requires the use of one’s ‘instinct,’ hence the name. With both eyes open, you need to look and focus on your planned target, then release the arrow. Logically, instinctive aiming is a more complicated approach, and it requires patience and time before you can finally consider yourself ‘good’ at it. On the flipside, it is much easier to perfect the use of bow sights. However, instinctive aiming also comes with its own advantage; you no longer need to do heavy guesswork especially when dealing with unlikely hunting situations. Operating your bow with instinctive aiming requires you to look and focus on your target with both eyes open and release the arrow. This is somewhat hard especially for beginners because it’s not entirely convenient to assess whether the target is properly aimed or not, considering that you are opening both of your eyes. Aiming for bull’s eye may require constant practice for some periods before mastering it. For beginners, instinctive aiming can only become handy when the game is large or when you are close to your target. Hunting with a bow sight is more precise and typically gives you a bigger chance (almost perfect probability) of successfully taking down your game. However, this is provided that you’re able to determine your distance to your live object. You simply have to line up the sight pin on the target and release the arrow. That’s it. Whether you use a bow sight or instinctive aiming, your gestures and the way you handle your bow still play a vast and significant role in archery. Having the right bow sight or instinct will mean nothing if you can’t properly hold your bow in the first place. 1. For right handed archers, extend your left arm (the one holding the bow) forward and parallel to the ground. 2. Use your right hand (drawing hand) to pick up your arrow from behind and carefully nock it on the string. 3. Keep your left hand in that position as you carefully pull back the arrow to the farthest it can or to your face. This is your anchor point. 4. Aim at your target using your selected method of aiming. Of course, a bow sight is the most recommended approach as it’s more defined and fixed. This also depends on the type of equipment you’re using. You just have to make sure that you utilize a technique that you are most comfortable with. There are multiple types of bows like the compound, recurve, traditional, etc. And each of this type may have its own preference in drawing your arrow, but they are still similar to each other. 5. Release the arrow and repeat all the steps from step 2 and beyond if you need to shoot more. The arrow will have a straight and stable fight when you let your fingers to ‘instantly’ slip away from the bowstring – the ideal way of releasing an arrow. By quickly sliding your fingers away from the string, you’re able to allow the arrow to have all the potential energy converted into kinetic in one, swift motion without wasting a substantial amount of energy. The more force shifted to the arrow, the faster and the more accurate it flies. As a result, the chances of hitting your target increases dramatically. Who wouldn’t want to miss their target? After releasing, make sure your bow arm is still directly pointed at the target. You don’t want to extend your arms again. The reason behind why one should avoid dropping his arms is to maintain accuracy for your second or third attempt. By maintaining posture and position, you’re able to increase the likeliness of a successful second shot. If you’re fond of watching movies, you might have noticed that great archers don’t drop their bow after having their first shot. They simply use their other hand to reach for another arrow and shoot once again. After releasing the string, another important reminder is to leave your drawing hand at your anchor point even if the arrow is already released. Determine first whether you need to take another shot or not by visually inspecting your game. It wouldn’t take a genius to know. The most important notice an archer must be aware of is to never ‘play’ with an unarmed bow. You must never fire a bow without a nocked arrow. If you release a string without any nocked arrow onto it; it can have a devastating effect. When you pull the string back, you know that a significant amount of potential energy is held. When there is no arrow nocked onto it, the energy will have no choice but to transfer to the bow itself. The consequences may not be noticed immediately but the next time you use the bow for real, it could possibly fly apart and injure anyone. 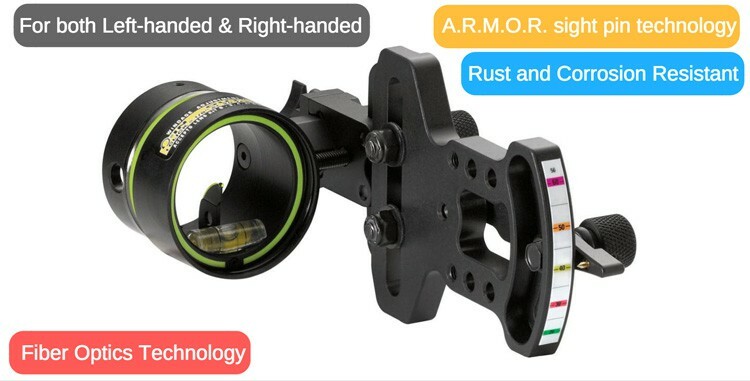 We’ve given you the list of best bow sights that are raking the most number of positive reviews in the market. Indeed, bow sights are essential in the sport of archery especially to hone the archer’s aiming skills with pinpointed accuracy. There are bow sights that fit your needs and your skillset, and it now depends on you on what kind of sight will be your best accomplice along with your bow. Woo. Nice post. Thanks for sharing. Can you tell me? Which site I could Best Bow Sight Under 100 Dollars? Thanks for your notice. I sure this link is right. But have some problem with this seller, and the seller change other image of this product. You can see picture in the reviews on amazon, that right product with this name. The Trophy Ridge React One Sight Black 1 Pin .010 RH link and pricing to Amazon is inaccurate. 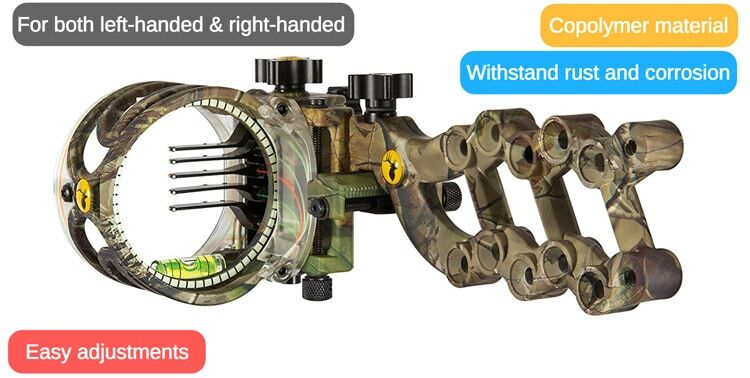 when you use the link it takes you to amazon with the correct description, but the image showing is for the Trophy Ridge React 5 Pin Bow Sight. Customers only find out the actual item they are purchasing when they go to the checkout. your information and Amazons information is incorrect and bad advertising. You should be more carful and completely check your links.